Free shipping and no mail-in-rebate to fuss with. Is your old and crusty printer showing signs of giving up the ghost? If so, you can buy a brand new one for not a lot of coin—B&H Photo currently has Canon's Pixma MG6821 on sale for a low $35 with free shipping (and free expedited shipping if you add items to bring the total to over $49). This printer normally sells for $70 or more, sometimes even as high as $150. A look around the web shows Best Buy, Staples, and Office Depot all selling it on sale for $80. The lowest we've seen outside of B&H Photo is at Amazon, where it's currently marked down to $50. 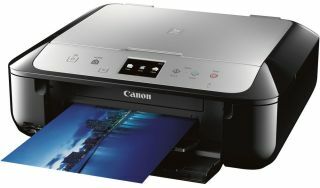 Canon's Pixma MG6821 is an all-in-one photo printer with wireless connectivity. It supports a max resolution of 4800x1200 dpi and has a rated print speed of 41 seconds for a 4-inch x 6-inch photo. There are five ink tanks in this printer, so if you run out of a specific color you can replace just what you need. And depending on how you feel about using generic inks, there are plenty of 5-packs on eBay for around $16. We're not suggesting you go that route—printer companies price gouge for genuine ink but also warn that generic alternatives can clog and ruin the print heads—just a friendly heads up that there are affordable generic ink options for this printer. This deal is valid for today only. Go here to take advantage of it.